On March 3rd, the Food and Drug Administration (FDA) approved the go-ahead for a clinical trial testing an innovative stem cell-based treatment for HIV/AIDS. Researchers at City of Hope working with Keck Medicine of the University of Southern California (USC) and Sangamo BioSciences plan to genetically modify a patient’s own blood stem cells to resist infection with the AIDS virus. CIRM is investing $5.6 million as part of the Strategic Partnership Award to fund the trial. Sangamo is matching that amount. CIRM is also funding another trial sponsored by Calimmune, Inc. that uses a similar approach to treat HIV/AIDS. 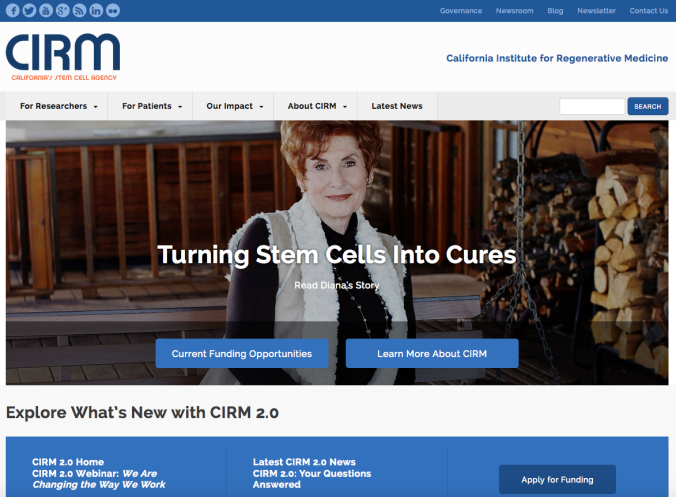 To reflect the radical overhaul of stem cell research funding with CIRM 2.0, we launched a complete redesign of the CIRM website. In improving the site, we hope to better serve two important audiences who are critical to achieving our mission: current and potential grantees from research institutions and industry; and patients, patient advocates and the public at large. As part of the digital facelift, the site is now more easily viewed on mobile devices. With up to 40 percent of our visitors coming to cirm.ca.gov via a smartphone or tablet, it was critical to create a superior mobile user experience. At its March meeting, the CIRM governing Board awarded $25.2 million to stem cell-based research into seven deadly or disabling disorders. The funding is part of the agency’s Preclinical Development Awards program. This program supports projects that use or target stem cells, have shown potential in early stage research and are now ready to move one step closer to clinical trials in people. The successful projects target Spina Bifida, osteoarthritis, diabetic wounds, Alzheimer’s disease, Huntington’s disease, osteochondral defects, and Severe Combined Immunodeficiency (SCID), also known as ‘bubble baby’ disease. On March 16th, CIRM grantee Reza Ardehali of UCLA was awarded the 2015 Douglas P. Zipes Distinguished Young Scientist Award at the American College of Cardiology’s 64th Annual Scientific Session and Expo. 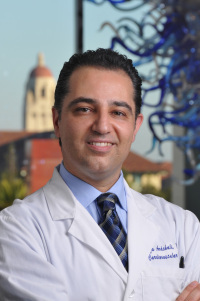 Dr. Ardehali’s work focuses on trying to gain a deeper understanding of the role that stem cells play in the heart’s limited ability to regenerate after an injury, such as a heart attack. He ultimately hopes to harness and enhance this ability to provide new therapies for injured hearts. The CIRM governing Board will hold its fourth meeting of 2015 by telephone. The agenda and details will be posted to the meetings page 10 days before the event. Please note that the May 21st Board meeting has been relocated from San Diego to the Bay Area. The September 24th meeting will be held in San Diego. More details to follow. To submit an application, visit our CIRM 2.0 awards page for more information. Our Discovery and Translational Stage Programs will be announced later this year.